Doctor Maryse Narcisse, recent presidential candidate of Haiti's Famni Lavalas party, visited California for her first time in late April. Narcisse's involvement in Famni Lavalas goes back many years. Under President Jean-Bertrand Aristide's second term, she was General Director for the Ministry of Health. She also helped found the Aristide Foundation's medical and nursing school, UNIFA (University of the Aristide Foundation), which has expanded in recent years. After the U.S.-backed coup against Aristide and Famni Lavalas in '04, Narcisse represented Aristide during his time in exile (and visited him in South Africa multiple times). She herself was also in exile for a time following the coup. Upon her return to Haiti in 2007, she survived a kidnapping at gunpoint. She coordinated medical responses to the cholera outbreak introduced by U.N. troops, and the devastating earthquake of 2010, and Hurricane Matthew in 2016. 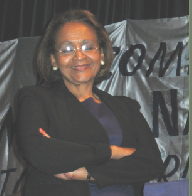 As presidential candidate representing Fanmi Lavalas circa 2016, she enjoyed great popularity. 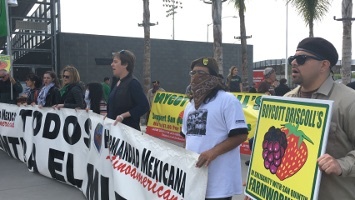 Close to 800 union members, community people, families, activists, and students marched through the streets of Riverside to commemorate May Day. According to the organizers, one of the purposes was to send a message to the City of Riverside that they were serious about a campaign to make Riverside a sanctuary city. The event started with speakers at Fairmount Park. 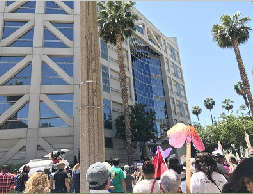 Later, the march stopped at Riverside City Hall to demand that the city become a sanctuary city. The most powerful stop was in front of the Riverside county jail. Families of the prisoners on hunger strike spoke and it was an impactful act of solidarity for the prisoners. The organizers coordinated with the police, part of a trend in marches in the southland. Protesting the wall, racist ICE attacks, NAFTA and union busting, workers and youth on both sides of the US and Mexican border joined together on March 5, 2017 in San Ysidro and Tijuana. Speakers talked about the role of tearing apart families with the use of immigration laws which benefit the bosses while destroying lives. Farmworkers from San Quintin who are members of the Alliance of State National Organizations and Municipal social justice (AONEMJS) and the National Independent Democratic Union of Agricultural Workers (SINDJA) marched in Tijuana and were joined on the US side of the border by LCLAA Sacramento, the Brown Berets, Fight For in San Diego, United Taxi Workers San Diego, PSL, UPWA and other organizations. The Los Angeles Women's Theatre Festival empowers women artists to engage and inspire communities through the production of multidisciplinary solo performances and education outreach. The Annual Festival honors the achievement of extraordinary women in theatre. 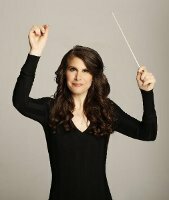 Cavallari has worked on more than 50 film scores as performer, arranger, conductor or composer. She has composed for the L.A. Kings; has worked on 25 television shows; 16 stage musicals; and written hundreds of songs, jingles and assorted musical offerings. 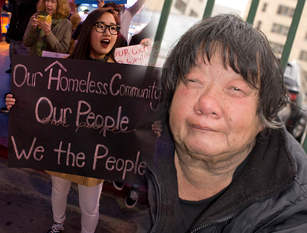 Photos of the Yes on H March for the Homeless accompanied by ones of homeless people in downtown L.A by Robert Stuart Lowden. Measure H, if passed on March 7, would generate about 0 million, which would go to housing, medical supplies, and more. The march on February 25 was organized by Monday Night Mission and LA on Cloud9. On Saturday afternoon, approximately 200 passionate people turned out. Many motorists saw us, and we passed the Pantages Theatre just as a big crowd was leaving. The theatergoers had to exit in a small stream because of us, and they got good views of our signs.